When Halt and Catch Fire debuted, I watched the premiere three times in two days. (I also gave it a good review in PopMatters.) When I think about why I was so immediately drawn to it, I think of this pillow, which I helpfully circled in red in the below screengrab. 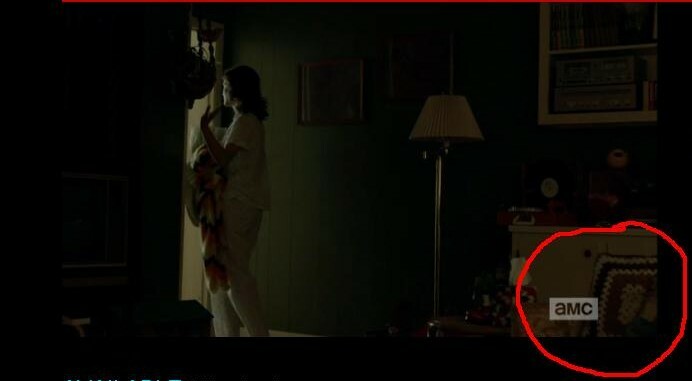 Screengrab of ‘Halt and Catch Fire’. Mind the pillow in the corner. It’s a dark object in a dark image, to be sure. But, even though it was hard to see, I recognized it. My family had the same thing, in blanket form. 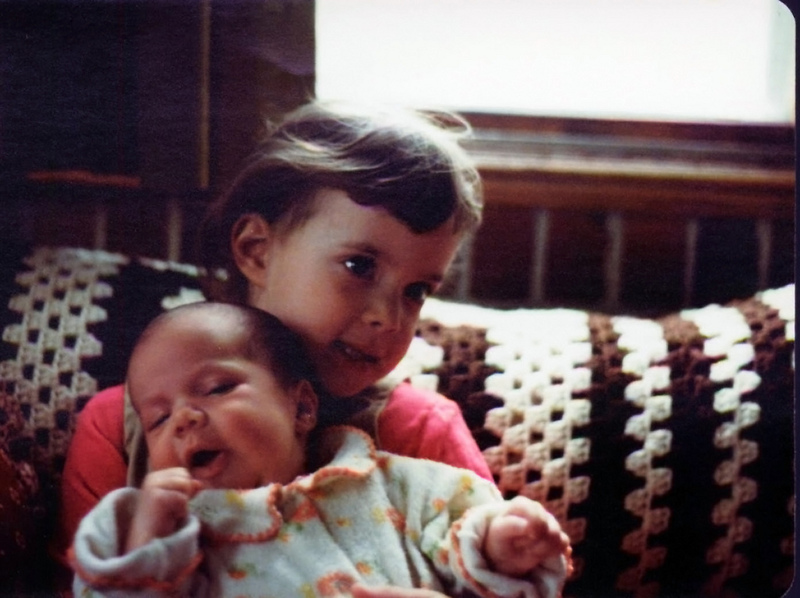 My sister holding me as a baby. I made that same face in every photo for at least the next four years. As should be obvious from the baby photo above, I am a child of the ’80s. But, when you ask me what I remember about the ’80s, I’ll tell you about Cabbage Patch Kids and Alf, but I would never say weird, brown-and-white crocheted blankets and pillows. Similarly, my dad didn’t look like Gordon Clark in the ’80s. My dad did work with computers at the time, but he had a mustache with no beard, and he didn’t wear glasses. Still, there’s something about the way Gordon Clark looks that reminds me of my dad in the ’80s. 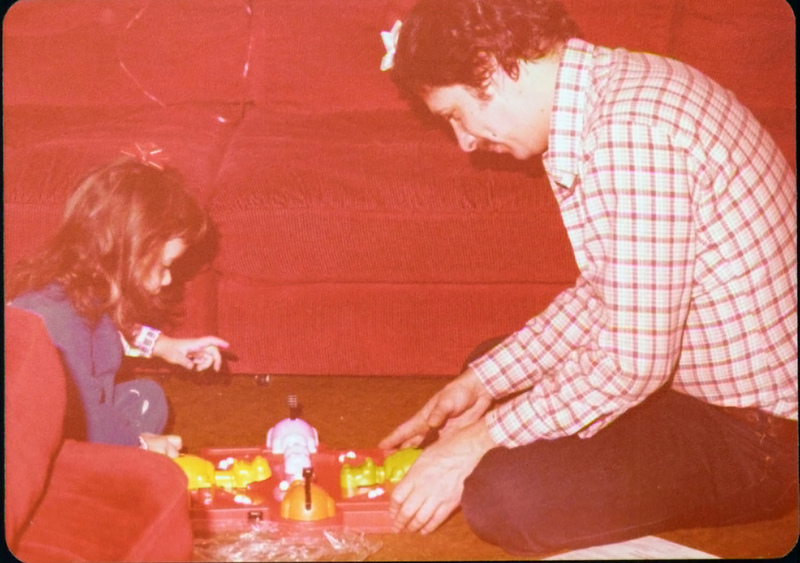 My dad, circa 1981, playing Hungry Hungry Hippos with my sister. A couple episodes in, the coders in Halt and Catch Fire were addicted to Adventure, the text-based game that was a precursor to Zork. My dad and I played Zork for hours. (He even tried to send me a Zorkmid recently, but it got lost in the mail!) I knew that, when the show mentioned “a maze of twisty little passages,” they were quoting the game verbatim. Zork is still one of my favorite games of all time. I mention all of this to say that, what hooked me about Halt and Catch Fire was the way it captured the 1980s the way I remembered it. It didn’t make the obvious references to Madonna or Rubik’s cubes. It wasn’t the jokey, day-glo ’80s of The Wedding Singer. It was the ’80s of my faded family photographs. My Sportsalcohol.com colleague Ben also enjoyed the in-the-know ’80s atmosphere of the show. But, when he wrote about Halt and Catch Fire, he said it was most valuable as a business case, saying its narrative or characters weren’t strong enough on their own to make the show compelling. I disagree. Of course, a show doesn’t deserve praise because it plucked my nostalgia strings. But that’s why I stuck with it initially, long after everyone else seemed to weigh in with their “Joe is just Don Draper in the ’80s and Gordon is Walter White without the Heisenberg” snap judgements. And, as I stuck with it, I realized that the characters — the ones that were so quickly dismissed by everyone else, even Ben — were exactly the reason that I kept watching. It’s not that any one of them is a compelling figure on his or her own. As Ben pointed out, there’s no singular, charismatic antihero in Halt and Catch Fire. There isn’t a Don Draper or Walter White or Tony Soprano. (My colleague over at PopMatters does a good job of dismantling the Joe MacMillan/Don Draper Gordon Clark/Walter White argument.) It’s the way they intersect and overlap, pushing and pulling against each other, that make them fascinating. The three main characters each have qualities and flaws that are lacking in the other two. 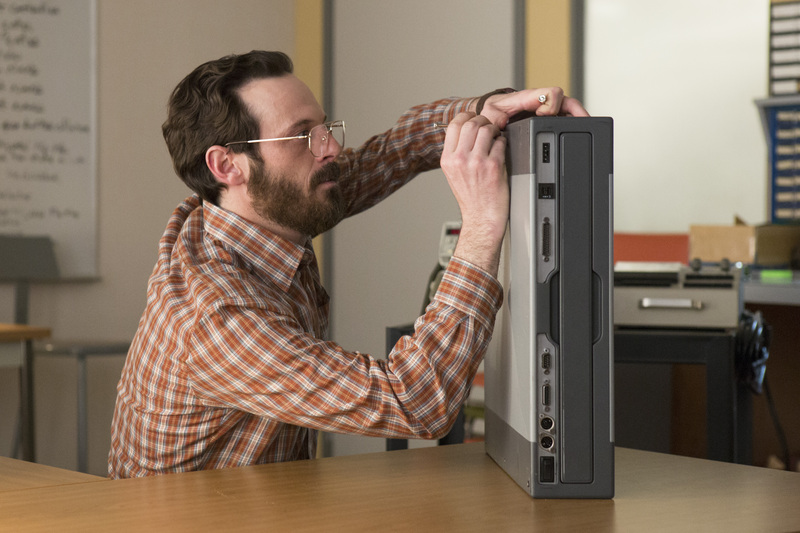 Basically, Halt and Catch Fire isn’t an ’80s Mad Men. It’s an ’80s No Exit. I made a chart to illustrate the point. In keeping with the theme of the post, I did it ’80s style, with pen and paper that I faxed to myself. Warning: spoilers from here on out. I’m really impressed by the way the show creates a triangle that’s not your typical love triangle (mostly). Joe, Cameron, and Gordon are locked together at Cardiff Electric. When they all are working together towards the same goal, they can really move the company forward. For example, in the (excellent) penultimate episode, Cardiff arrives at an electronics conference with no booth and no hotel suite, so they need to bully another company out of theirs. Gordon attends a pre-conference demonstration for a printer company, then uses his technical know-how to punch holes in their product. He knows exactly what questions to ask to expose the weaknesses of the printer being demoed. Then, once they’re convinced that their printer will be a failure, Joe sweeps in and uses his handshakefulness to sweet-talk that company out of their booth and suite, convincing them he’s doing them a favor by buying them out so they can break even. These moments of togetherness are few and far between. 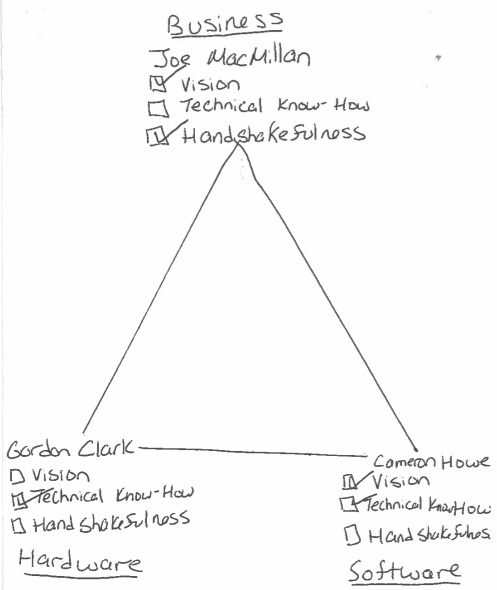 More often, Joe, Cameron, and Gordon are working at cross-purposes. Their egos push them each to try and get their corner of the hardware/software/business divide to the forefront. This gets even more interesting when you see how they each push each other’s buttons. Joe’s soft spot is his love for Cameron, so Gordon threatens to have her arrested for hacking into the company’s bank accounts. Gordon’s weakness is his wife and family, so Cameron tries to recruit Gordon’s wife to a new company she’s starting. (And Cameron is usually her own worst enemy.) Really, though, nothing happens unless they’re all working in tandem. The first season of Halt and Catch Fire ends with the three of them separated. Gordon is head of Cardiff, but he has no idea what the company’s next step should be. Cameron starts her own company, called Mutiny, but her heirarchy-less structure and abundance of coders is in dire need of a sales force. And Joe is still looking to create the perfect, groundbreaking Next Big Thing, but he no longer has a company or staff to lead. To me, this is not a satisfactory ending. I want them all to realize how much they need each other, no matter how torturous it is for them to work together. I want them to really be No Exit, stuck together for eternity. I want them to fail on their own and come crawling back to each other. They could finally start working together and achieve greatness. Or, they could, you know, kill each other. The show makes it seem like these two outcomes are equally possible. And that’s why I want a second season.